It is generally believed that spatial prediction is robust against model specification, while the standard error computation is not so robust. This example investigates the effect of using these different models on the prediction and associated standard errors. In the section Theoretical Semivariogram Model Fitting in the VARIOGRAM procedure, a particular theoretical semivariogram is fitted to the coal seam thickness data empirical semivariogram. The chosen semivariogram is Gaussian with a scale (sill) of and a range of . For prediction with the saved Gaussian model, you use the following statements to run the KRIGE2D procedure with input from the SemivStoreGau item store. You invoke the item store with the RESTORE statement. The STORESELECT option in the MODEL statement that specifies that you want to use the selected model in the item store as input for your prediction. The VARIOGRAM procedure fits the spherical model successfully, and the estimated parameters for this fit are shown in Output 49.2.1. 0 0 8 . . The fit summary is displayed in Output 49.2.2. 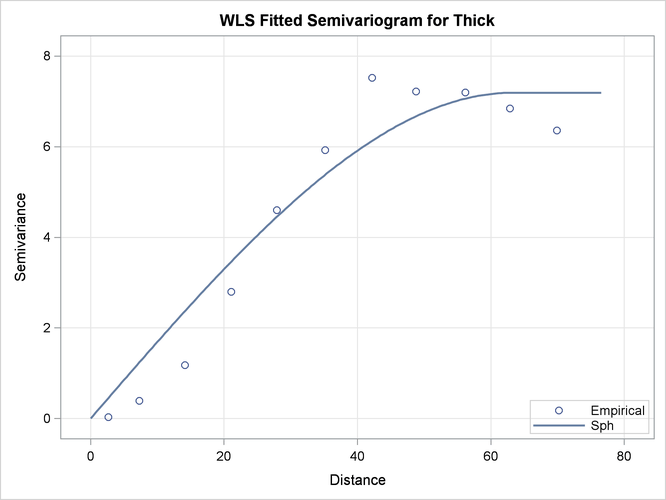 When compared to the corresponding result in the section Theoretical Semivariogram Model Fitting in the VARIOGRAM procedure, the goodness-of-fit criteria indicate a worse statistical fit for the spherical model compared to the Gaussian. Output 49.2.3 suggests an acceptable fit of the spherical model to the thick data set. Obviously, the fit of the spherical model in the sensitive area near the semivariogram origin is less faithful to the empirical semivariance than the Gaussian model. The following analysis explores the consequence in the kriging prediction of this discrepancy. Output 49.2.4 shows that on average the predicted values are very close for the two semivariogram models. The mean relative difference in the prediction values is close to zero with a low standard deviation, whereas the relative difference values fluctuate with an absolute maximum of about 5%. However, note that the mean relative standard error is about -96%. According to the definition of the stdRelDiff variable, the high negative value indicates that the prediction error difference between the two models is very close to the spherical model prediction error. Hence, the prediction standard error of the spherical model is substantially larger than that of the Gaussian model. In fact, the prediction relative error never gets smaller than about 66% for the two models, where the negative sign in the Minimum and Maximum columns in Output 49.2.4 means that the prediction error is always greater for the spherical model.